This is the Z100 "Tuning Aid" from Clifton Laboratories, as described by Jack Smith K8ZOA in the January/February, 2008 issue of QEX. I bought the kit and put it together as sort of a post-Christmas present to myself. Assembly was straightforward until it came to making the LED bar-graph indicator, which you must construct out of individual LEDs and spacers. Getting a neat result is tricky. I judge I managed it fairly well on the first try, but you need to read the instructions carefully. A number of hams have contributed handy alternative techniques that Jack includes in his write-up. Assembly of the board into the case, along with a clear lens and an optical filter film is the next tricky part. All in all the mechanical work with the LEDs and the case seemed overly difficult. It would have been very helpful if the filter film could be dispensed with -- e.g., if a neutral density Lucite lens could have been used. Operation (for an hour so far! ): The Z100 is easy to connect and use. It does require reasonably strong CW signal (i.e. fair SNR) to make the CW note show up clearly out of the noise. 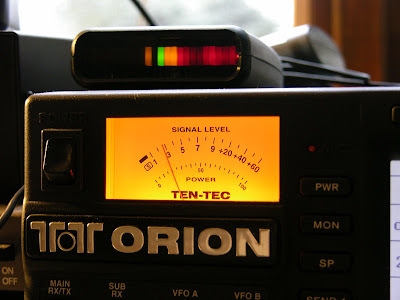 I seem to work weak stations quite a lot, and the tuning aid may be difficult to use for them. A more intelligent algorithm would be able to pick a coherent signal out of the noise much better, but that would be beyond the capability of the simple PIC processor, I reckon. It would boost this kit well out of the $60 price category. This kind of tuning aid should be very helpful to any CW or RTTY operator. (I suppose it would make a reasonable guitar tuner, too...) In an age of DSP radios, this capability should have been incorporated into the transceiver itself, but alas this is not yet true of my radio.